I’ve never done this before, but I’m going to try it this year—cornbread dressing. But first I’ll need to bake a grain-free, gluten-free cornbread. I thought a little longer than usual about how to title this post. Like the mashed potato posts, the title “Cornbread” is somewhat misleading. I’m not trying to fool myself or anyone else, but it does taste like cornbread. Before I began baking gluten and grain-free, I had tried a number of cornbread recipes, and I even resorted to using the Jiffy mix on occasion. This recipe is for cornbread, but there’s no hint of corn anywhere in it. I think that’s part of the irony of how we eat, that is based on memories of foods we expect to have or have had in the past. Or foods we want to have but avoid for health reasons, or because we’re selective in what we eat. I’d like to change that a bit, at least in my mind. It’s much easier to appreciate what a food offers rather than what it tastes like, or imitates. So I’ve tried to change my expectations. Instead of hoping a cake will taste like the cakes I’ve had in the past using all purpose flour, I experiment to see if I can create a recipe that I like and that is appealing in it’s texture, flavor, taste, and in some cases, the cost of the ingredients. Almond flour happens to make a great base for cornbread, even when it doesn’t contain a single grain of cornmeal. Adding coconut flour lightens up the texture, reduces the amount of nut flour in the recipe, and adds a boost of good fiber. I should mention that I do have a recipe for blueberry corn muffins that combines both almond and corn meal, but it’s not grain-free. 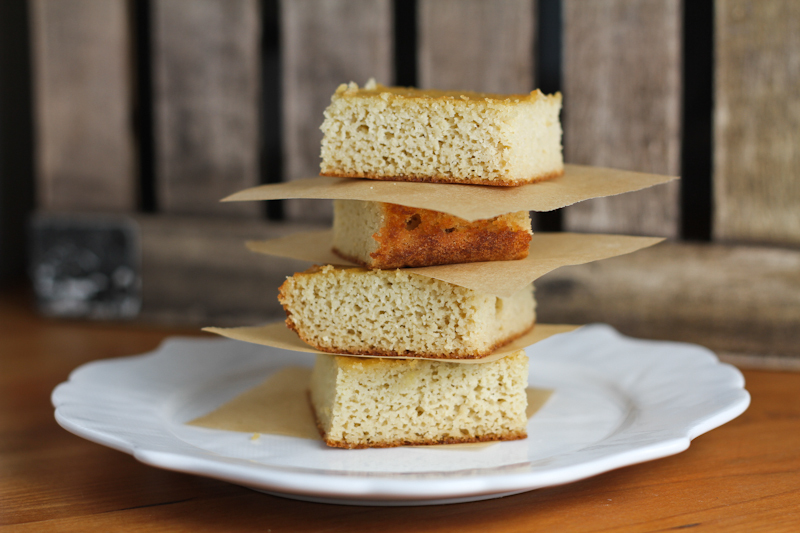 So here’s a gluten-free and grain-free cornbread. It’s a slightly sweet, slightly salty, slightly buttery version of cornbread. The basic kind. The softer cake-like kind, not grainy. But don’t let me stop you from adding to the fun, or changing things up. I can see adding some minced jalapeno, chili powder, chives, or some grated cheddar to make it savory. Or if you like it sweeter, add a bit more honey (about 1 tablespoon). You can also use the batter to make corn muffins. Or just bake it as a basic cornbread, as is this recipe’s intent. Cool for a minute, slice into squares and serve with a hot bowl of your favorite chili or soup. You can also turn this into brown butter cornbread by browning the butter in a pan before adding it to the batter. I don’t always have the patience for this, but the nutty flavor of browned butter is something to consider. And the smell. Just that much better. And if you like your cornbread to have a slightly grainy taste, as if you were using a medium grind cornmeal instead of a fine grind, cut the milk in the recipe by about half (reduce to a 1/4 cup). Another option is to use Bob’s Red Mill coconut flour because it has a slightly larger grind, so the flour grains are not as fine as some others. I use an 8-inch by 8-inch baking pan lined with parchment paper and the bread is about an inch in thickness. To get thicker bread, use a smaller baking pan or double the recipe and use a larger pan (about 9-inch by 12-inch).It makes 9 or 16 servings when baked in an 8-inch by 8-inch pan. To make this low-carb, replace the honey with 2 tablespoons of low-carb sweetener. Preheat your oven to 325° F/165° C.
Line an 8-inche by 8-inch (20.3 x 20.3 cm) baking dish with parchment paper or other non-stick covering, or grease well. Mix all the dry ingredients in a bowl until well blended. Add all the wet ingredients to the dry ingredients and blend well. Pour the batter into the baking pan and bake for 20 minutes, or until a toothpick inserted in the center of the bread comes out clean. Store in the refrigerator for a week or so, or freeze for a few months. Looks awesome! Needs to go on my “to make” list! I wish I could hug you! Really you have no idea … THANK YOU for posting this. I know this will work for me. I appreciate this so very much, have a happy blessed Thanksgiving, I am grateful for you. Sending you a virtual hug! thanks! One of the most difficult things to have to live without on the SCD diet is cornbread. I can’t wait to try this! One question: Being from the deep south, I have always cooked my cornbread in a hot, oiled, black iron skillet to get a crispy crust with a soft interior. Might this be possible with this recipe? I was waiting for that question because I’m curious to know as well. I would definitely butter the skillet well. As I too am in the deep south, I did it that way and turned out great. This is such a lovely recipe and I’m totally using your stuffing recipe this year! Thanks Jenni! So good to know it worked. Thanks! I’m still waiting for my skillet from Amazon. Maybe today? Jenni, when using the iron skillet for this recipe, do you place it in the oven or is it used on top of the stove? I’ve added this to my coconut flour cookbook coming out next year; I can’t share the entire recipe but the general gist of it is: start it on the stovetop for a few minutes and then bake in the oven for about 10 minutes or so. Is there a reason to use dairy free milk? Or would cows milk work? I was just thinking about how I was going to have stuffing this year! Can’t wait to make this. Same here – about the stuffing part. You can use any kind of milk, cow included. My son can’t do eggs. Do you think flax eggs would work here given that the bread’s just going to be used in a stuffing? I think so but you won’t know for sure until you or someone else tries it. Just in case any egg-free folks were wondering, I substituted flax eggs for regular eggs, and I used the bread in the stuffing, and it turned out GREAT. The bread was a little darker, a little more moist, and it took a little longer to cook, but it was perfect in the stuffing. thanks Nichole! That’s great to know. I wonder if white chia seeds would work and keep the color lighter? Do you mean, chia in place of the eggs? Thank you!!! I made your “corn” bread today for breakfast and it was amazing. Thank you again! Good to hear! You’re welcome. Hi, I’ve just come across your website recently and have made this (cornbread) recipe and your almond flour chocolate chip cookie, both are great! I made this one using coconut oil and it turned out delicious! Thanks so much! I made this with earth balance butter, and it turned out really well. I bet this tastes amazing with real butter, while substitute butter is good, nothing compares to that real butter taste! I love love love your site. I am not gluten free and often cook with organic flour but your respies provide a much sought after balance to my family’s diet. I do have a question though, what is the significance of grain free. I am so insoire by your site and reccomend to folks all the time. Thanks Samantha! and thanks for spreading the love too! The grain-free stems initially from my need to remove a lot of stuff from our diet following a protocol for Crohn’s (SCD diet – see on this site). But I do appreciate that not everyone is affected by grains. At this point I’m enjoying coconut and almond flour quite a bit, but I am curious to explore other flours/grains such as millet, rice flours, and oat flour. I’ll post something eventually. I’m also finishing up a coookbook that is for folks following a grain-free, gluten-free diet, so I’m immersed in those recipes at the moment. You know when a recipe is good, when your kids want to eat it !! I found this recipe as I was desperate for a fatter free bread type than my ham and cheese muffins I had been making as a staple. These are really, really good and do taste like cornbread !! Thanks Tanya. So true – kids are a good barometer and reality check for lots of things :). I currently use either Tropical Traditions or Honeyville Grain. I will use Bob’s as well, but I grind it down in my food processor first. I just made this and it was AMAZING! I am so happy to have come across your blog. Thanks for the great recipes! I’m wondering – isn’t corn bread supposed to have corn or corn meal as one of the ingredients? Nothing at all corn-related is in the list of ingredients in this recipe. I’d love to make it but I wanna know if this is just a leave-out? I renamed it (so now it has the same name as the recipe in my book and it’s a bit more clear). It’s not a leave-out but thanks for checking. 🙂 I do have a corn muffin using corn and almond flour though. Best wishes. this looks great and I have been searching for this to have w/ my ham/bean soup. I am on a low glycemic eating plan and was wondering if you have tried subbing truvia or stevia for the honey? or if anyone else has, does the batter really benefit from the stickiness of the honey?, perhaps I could even sub in my molasses instead? you’ll need to sub something to make up for the moisture, volume and “stickiness” of honey. Molasses might work well, I haven’t tried it. Do you have a carb count/nutritional data on this? It looks amazing! I have missed cornbread! Also wondering how the substitution of molasses for honey went. This baked up beautifully in a cast iron skillet, if anyone cares. 😉 I browned the butter in it first to add to the batter, then greased the pan a little more with coconut oil. I would personally err on the side of less (coconut) milk… My bread seemed a bit moist. I like the idea of using less liquid for a crumblier texture. Served it with a maple syrup/honey/cayenne/cinnamon butter. It was a really nice treat. As usual, I love your recipes! Wow! I just made this tonight and it is AWESOME!!! I used maple syrup instead of honey though, and used a cast iron pan. I think ithis would make delicious french toast too but I like this so much, I don’t think I’m going to need to do that! Thank you!!! You’re welcome! yes, it’s great in a cast iron skillet. Thanks for the great recipe! I’ve made it a couple times recently – the first time in an 8×8 pan and the second time as muffins. Both times I used “crispy almonds” (I used 56 grams of almonds as the equivalent to 1/2 cup almond flour) and just put all of the ingredients into my vitamix – very easy and only one container to clean up! I also used yogurt in place of the milk. Everyone in my family loves it. This recipe is amazing!! I only had trader joes almond meal so the color wasn’t as cornbread looking as it would with blanched almond flour but I didn’t care, it was decadent. I sprinkled shredded cheddar towards middle of baking time. My daughter is on the GAPS diet and she also has tree nut and egg allergies. I wanted to try making a stuffing, but I was wondering if you think the bread would turn out ok with a flax seed egg substitute and either subbing the almond flour for sunflower seed flour or just using all coconut flour. I’m not sure since I haven’t tried it, but my experience is 1 flax egg usually works. I made this with a slight variance. I used flaxseed meal instead of almond flour die to a nut allergy. Turned out amazing! Close to the same texture as cornbread. I also added the jalapeños and cheddar. It was great with chili. Thank you, thank you from someone with a corn-sensitivity living in the Southern US who happens to LOVE cornbread. This sounds like a GREAT alternative. No more stuffy nose for me. Made it today, eating it now; used 1 tbs coconut sugar in place of honey and had only 2 eggs. It is very good; my non-paleo husband likes it a lot also. When his dental work is finished, I will try the skillet method to cook. Thanks for a good recipe. You’re welcome! 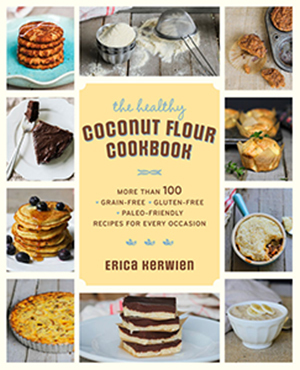 FYI, the skillet method is in my Coconut Flour cookbook, and it has a similar texture. Loved it! Thanks. I must have missed how many carbs per serving? Another absolute fail-proof winner. I love using this recipe as a base for every kind of savory bread and muffin you can think up. The almond/coconut combo is perfect. Thanks from the bottom of my heart Erica, you make eating on the SCD delicious. My family now requests these recipes for the holidays. I’m not a great baker…that is unless I use your recipes. They come out perfect EVERY time. Aw thanks. It truly is a failsafe recipe. Much thanks for your thoughtful comments. I tried this recipe with lentils the other night and it was a hit! So simple to make too which is a plus for a busy family. Thank you so much for sharing it. Now I am sharing it too. If you can’t have honey and don’t like sweet cornbread anyway, would you add an extra 2T milk to make up for that liquid? Yes, use milk, cream, or yogurt to make up for the honey. It may need a bit of honey for the taste though, but see how it turns out.